Condominum complex damaged in hurricane argues for resilient design solutions to mitigate damage from storm winds. Hurricane force winds are relentless and, as we’ve learned, they do not differentiate or discriminate. Any structure in the storm’s path may be at risk, and while no building is entirely safe, some are more resistant to damage than others due to resilient design and construction. So, in the aftermath of a devastating storm, it behooves property owners to carefully assess damaged structures and consider restoration and repairs that will mitigate future storm damage. Whether the plan is to repair, restore or rebuild a storm-ravaged building, there are many solutions today that can help withstand high winds and water damage in the future. In many cases, a relatively small up-front investment can result in big future savings based on losses avoided. Hurricane protection used to be limited to building on pillars to elevate a structure above the flood zones, using wind-resistant concrete block construction and putting up hurricane shutters. Well, we’re a long way from Kansas Toto, and the art of hurricane protection for the built environment has come a long way since then. 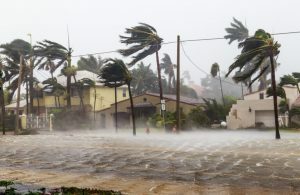 Today’s state-of-the-art building materials can help fortify structures against hurricane hazards: winds, flying debris, and flooding from rain or storm surges. Cost-effective, hurricane-resistant building materials and technology do exist and can help the built environment withstand these extreme weather events. When windows burst from high winds, buildings can pressurize as wind rushes in, popping off the roof. New roof attachment methods can add strength, and spray-foam adhesives (which are applied on the inside of the house’s roof and double as insulation) are rated for higher wind speeds. To deal with flooding, hydrostatic vents can allow water into the home but stop floodwaters from accumulating, potentially degrading its walls and foundation. A few basic structural upgrades can make for improved performance and help keep coastal structures safe including: properly designed footings, pilings and flow-through designs, a continuous load path to resist wind uplift; strong lateral bracing (or engineered shear walls) to resist the sideways pressure of wind; hardened or protected windows and doors to resist penetration by wind-borne debris. There are also exterior cladding options to protect against storm winds, water intrusion, and wind-borne debris — the leading causes of building envelope failure in hurricanes. Most of these systems can be installed economically on a variety of construction types, including metal frame with gypsum sheathing, wood or steel frame with plywood sheathing, or concrete masonry. Improved watertight and water-shedding exterior insulation systems that resist rain penetration in storms are also available and come in a variety of decorative and protective wall finishes, offering aesthetics as well as protection against some of the most severe weather conditions in North America. Building codes are the baseline defense against hurricane damage. Improved building codes in Florida (the most stringent in the nation) after Hurricane Andrew required installing impact windows, using stronger ties between roofs and walls, and securing roof shingles with nails instead of staples. And indeed, newer buildings built to code fared better during Hurricane Irma. Strong, enforceable building codes play a huge role in prompting architects, engineers and contractors to embrace the concept of resilient design. Texas state officials, with the support of the local building community and regulatory agencies, announced a $61 billion plan to rebuild after Hurricane Harvey devastated the southeast area of the state with wind, rain and floodwaters, and resilient measures are part of the plan. FEMA has actually proposed policies to incentivize states and municipalities to take a more proactive role in mitigating damage—which will also mitigate recovery and restoration costs. FEMA has also developed publications and guidance on coastal construction in hurricane prone areas published by FEMA’s Building Science Branch. In addition, the U.S. Green Building Council has adopted a new resilient construction standard called RELi. The new certification system includes some LEED practices and gives property owners points for adaptive design features which mitigate the impact of extreme weather. A National Institute of Building Sciences (NIBS) study recently determined that for every federal grant dollar spent on disaster resiliency and mitigation, the U.S. can save an average of six dollars. These are impressive numbers to keep in mind. Another plus: NIBS also projected that implementing resiliency measures and building to stricter codes could create 87,000 new long-term jobs and increase the use of American-made construction materials by 1%. The Transamerica Pyramid in San Francisco is one of many older, iconic buildings that are benefiting from retrofitting and restoration. As reported by National Geographic this month, iconic buildings are often celebrated for their architecture that has withstood the test of time, but what lies beneath those favorite, enduring facades – the cladding and infrastructure — does not usually hold up so well. The majority of the world’s most famous structures were built long before sustainability, climate change, recycling and energy efficiency were key trends and mainstream buzz words. Enter the age of retrofit and restoration, which has (thankfully!) become the prevailing practice in preserving vintage structures worldwide. Aging buildings of note are being updated with new windows and claddings, lighting, heating and cooling systems, all of which are preserving the historic nature of the buildings, saving owners and operators money while also conserving energy. Some iconic structures that have set an example for others to follow include the Empire State Building in New York, the Eiffel Tower in Paris, the Sydney Opera House in Australia, the Reichstag in Berlin and the Transamerica Pyramid in San Francisco. The Depression-era Empire State Building completed a $13 million energy-efficient retrofit in 2013 that cut energy consumption by almost 40%, saving over $4 million annually. The upgrades are expected to eliminate105,000 metric tons of CO2 emissions over 15 years. In keeping with its original raison d’etre as a symbol of engineering prowess, the Eiffel Tower undertook a 4-year, $37 million renovation, completed in 2015. It included everything from installing solar panels to LED lighting, and adding enhanced glazing on glass. In addition to saving energy, the structure now generates much of its own electricity with wind-powered turbines in the building. The 853-foot Transamerica Pyramid, built in 1972, was the tallest building in San Francisco until it was eclipsed last year by the 1,070-foot Salesforce Tower. But it’s keeping up with the newer structure thanks to a sustainability retrofit and a gas-fueled cogeneration plant in its garage that generates 70% of the building’s electricity. In 2011, the Pyramid was certified LEED Platinum, the country’s highest rating for green buildings. Revitalizing iconic buildings is only a small part of the huge commercial market for restoration and energy efficient retrofitting. New York, for instance, is also tackling the improvement of energy efficiency in less prominent landmarks, investing nearly $500 million to improve its million-plus buildings. Buildings consume 73 percent of the electricity in the U.S., and indirectly create 38 percent of carbon dioxide emissions—more than industry or transportation. Experts estimate that only 10% of the 5.6 million commercial buildings in the U.S. are now “high performance” thanks to upgrades. The remaining 90% represent a huge market opportunity. Leaders in the building material and restoration industry such as Sto Corp. have been on the forefront of commercial restoration providing state of the art products and systems that can help preserve an historic structure as well as safeguard a property’s value by conserving energy, reducing operational costs, improving interior comfort, and enhancing curb appeal. Sto was instrumental in helping to restore the Georgia King Village residential towers in Newark, New Jersey. Built in 1976, Georgia King Village in Newark, New Jersey, was in need of a makeover. L+M Development Partners who acquired the two 18-story, affordable housing towers in 2016, were taking on a distressed structure, but were confident they could restore the complex. One rehab priority was installing a new exterior to replace the uninsulated precast concrete façade; the envelope was so porous that Georgia King residents were consistently unable to maintain a comfortable temperature in their apartments. Over the next few years, L+M Development added a fresh new design and structural improvements transforming the Georgia King Village into a more efficient, more comfortable, and more attractive complex, while preserving its affordability. Working with Sto Corp. products and experts, L&M upgraded the towers’ building envelope, using StoTherm® ci Essence, a system that combines the quality of StoTherm® technology with a StoGuard® waterproof air barrier incorporating air, water, and vapor control layers and protection against moisture intrusion. 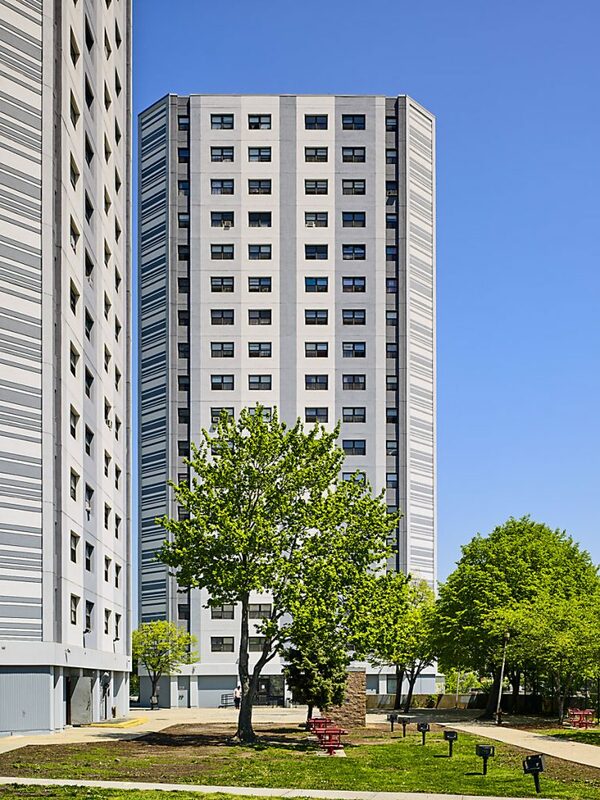 With a new cladding system that incorporates the StoGuard air and moisture barrier, the refurbished Georgia King Village towers are high, dry and handsome. Sto TurboStick®, a relatively new product, was also used to improve the speed and efficiency of installation. The product is a ready-to-use, single component polyurethane foam adhesive for securing Sto Insulation boards in StoTherm exterior wall claddings. It helps workers install the boards faster and easier than traditional adhesives. With eight facades, multiple drops and a difficult design pattern to follow, it was a challenging, project. Nonetheless, Georgia King Village residents were able to remain in their apartments for the duration of all these improvements. Their lives were not disrupted to accomplish the upgrade. In addition to the high-caliber products provided, Sto also worked with the property management team to mitigate any resident concerns. A technical representative from Sto Corp. was actually dispatched onsite to explain the re-cladding system and construction process. By walking residents through the installment timeline, which included a vision of the final result, they explained that ultimately the system would be more energy efficient, and their homes would be more comfortable and attractive. The makeover marks the official re-emergence of the residential complex as a symbolic cornerstone in Newark’s West Ward. Today, the positive changes continue, and the adjacent community has a new vitality. In fact, the McDonald’s restaurant adjacent to Georgia King Village recently renewed its façade and landscaping, and when choosing the exterior wall color, asked L+M for the shade they had used for their renewal project. The multi-national restaurant chain liked it so much that they matched the Georgia King façade’s gray for their renovations. SWRI is an international non-profit trade organization comprised of member companies in the commercial sealant, waterproofing and restoration construction industry. A valuable industry resource, SWRI has taken the lead in providing important technical data and training via its educational programs and publications, thus promoting industry-wide standards of application and products. The Institute provides a forum for contractors, manufacturers, design professionals and consultants to learn about current trends and new products, as well as to exchange ideas, discuss new methods of application and network with other professionals. The organization has developed technical and safety manuals, as well as training videos, and twice a year they host a technical conference – the next one will be October 1-3, at the Minneapolis Marriott City Center where workshops, seminars and training will be offered. The Winter Technical Meeting with be in San Juan Puerto Rico March 4-7, 2018, at the La Concha Resort. SRI has also developed validation programs that offer third-party verification of products and services offered in the industry. Additional sealant, waterproofing and restoration information may be gleaned from their trade magazine The Applicator which provides technical updates and news impacting the industry (available in print or digital format). New York City is full of aging buildings that have suffered the vagaries of time, erosion and gravity. Many of these structures have historical significance and/or are on Landmarked or National Register sites which has spurred a flurry of architectural preservation, restoration and evaluation of historic architecture. Preservation efforts — from restoration (a process that retains and repairs materials from the most significant time in a property’s history) to localized repairs, which might include improving water tightness around the building has become a booming business. The challenge of blending old and new architecture to ensure that the historic integrity of an old building is maintained has become an art form. Now there's financing available to cut energy waste in buildings of all types and sizes. PACE, which stands for Property Assessed Clean Energy, is a simple and effective mechanism for financing energy-efficiency retrofits and renewable energy upgrades that might not otherwise be affordable for commercial, residential, industrial, and agricultural buildings. PACE financing overcomes the upfront cost barrier these upgrades can pose by providing 100% of the financing for such projects. The financing is paid back via property tax assessments that can stretch as long as 20 years. In most instances, the related energy savings more than pay for the assessment. Through the use of innovative PACE funding, new energy-efficient heating and cooling systems, insulation, solar and lighting improvements can be immediately rendered cash flow positive. PACE funding has soared, as owners recognize the opportunity to increase their bottom line by reducing energy costs, to enhance the value of their property and do their part to offset greenhouse gas emissions. Since three quarters of the electricity generated in America is used to heat, cool, illuminate, and otherwise operate buildings, it’s not surprising that Scientific American magazine named PACE one of 20 “world changing” ideas.